Cashew nuts are actually seeds that adhere to the bottom of the cashew apple, the fruit of the cashew tree, which is native to the coastal areas of northeastern Brazil. The seed we know as the kidney-shaped cashew "nut" is delicate in flavor and firm, but slightly spongy, in texture. Cashews are rich in iron, phosphorus, selenium, magnesium and zinc, they are also good sources of photochemical and antioxidants that protect us from heart diseases and cancer. 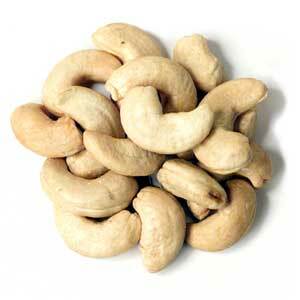 Rich in protein, cashew nuts are cholesterol free; boast a high amount of dietary fiber. The cashew nuts helps to maintain healthy gums and teeth, is an energizing food, cashews contains healthy monosaturated fat that promotes good cardiovascular health, Cashew is rich in antioxidants that help in the elimination of free radicals that may cause some cancer. Magnesium works with calcium to support healthy muscles and bones in the body. It also helps promote normal sleep patterns in menopausal women. Cashew nuts have a high energy density and high amount of dietary fiber, both have been attributed to a beneficial effect on weight management, but only when eaten in moderation. Cashew's has high copper content is vital in energy production, greater flexibility in blood vessels, bones and joints. Cashew nut consumption helps the body utilize iron, eliminate free radicals, develop bone and connective tissue, and produce the skin and hair pigment melanin. Free from pesticides, additives,No Genetically modified, No colouring.